I help women turn their passion, knowledge and expertise into a virtual time freedom business. ARE YOU READY TO CREATE MORE INCOME, FREEDOM & IMPACT? LET'S CREATE YOUR LIFESTYLE BUSINESS THAT TURNS YOUR PASSION INTO PROFIT! 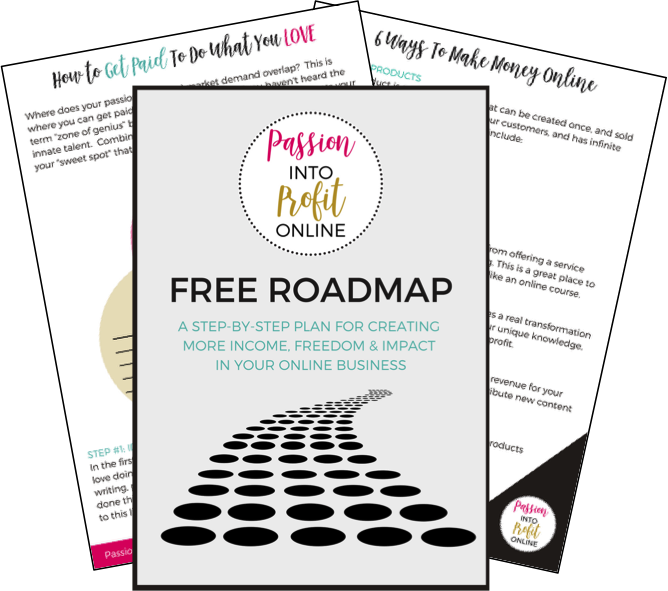 A step-by-step plan for creating more income, freedom & impact in your online business. Learn the 6 pillars for creating an online business that turns your experience and passion into profit. Learn how to package, sell, deliver & market your high-ticket signature online program in 90 days! Hi there, I’m Jenn and I started the Passion Into Profit Online Movement because I believe the education and employment systems in todays world are fundamentally flawed and need fixing. The traditional path of school, college and corporate employment leave people in debt, uneducated and soulless. Through PassionIntoProfitOnline.com our mission is to help everyday women start and grow wildly profitable online businesses that allow them to live lives of freedom and make a bigger impact in the world. Our training programs contain proven processes anybody can follow as well as a new way of creating value and generating income by sharing your life experience, knowledge and passions with others.